It is with regret that we announce the passing of Marigold Speir. Marigold Speir was an inspiration to all who knew her - a real character. She was an excellent organiser, loved golf and was held in high regard in many spheres. Her expertise and in-depth knowledge of the game of golf benefited so many players of all ages. Marigold was an Honorary member of Fife County. She was a fine golfer, having won the Scottish Championship in 1957 and she was Fife County Champion in 1975. 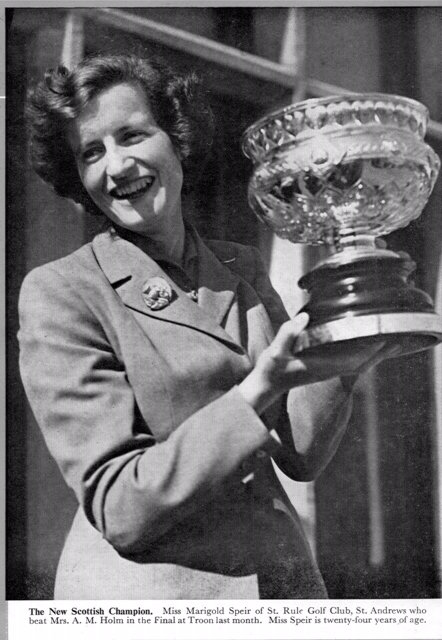 She represented GB&I in the Vagliano Trophy in 1957 in Morfontaine, represented Scotland in the Home International Matches in 1957, 1964 and1968 and was Captain of the Scottish team in 1971. She went on to become a Scottish Selector. She was elected Chairman and then Vice-President of the Scottish Ladies Golfing Association and was also a member of The St Andrews Links Trust for 6 years. She was captain of The St Rule Club twice and later became President. Marigold helped Christo Douglas inaugurate the St Rule Trophy competition and ran it for many years. This tournament is held in such high esteem (thanks to their endeavours) that it is now used in the selection process for GB&I teams. Apart from her golfing achievements, she was a leading light in the Friends of the St Andrews Botanic Garden of which she was Secretary. She was also a faithful member of her church choir. Thank you to Alma Robertson for the tribute, and we wish Marigolds family our deepest condolences at this sad time.